PhotoOnWeb is a free software for creating online web albums in Windows 8 and to host photos online. This an efficient and handy tool to create customized photo albums and host them over the Internet. Now, no need to spend time on sending pictures by email to share with your colleagues, family, or friends. 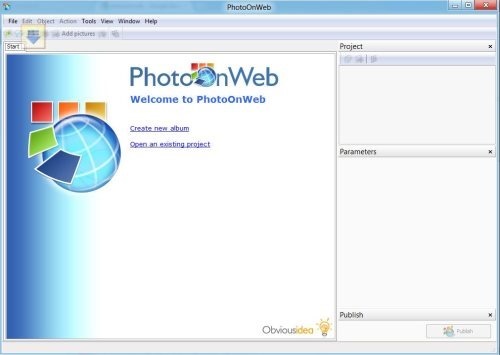 Using PhotoOnWeb, you can create albums and host them over the Internet. You need to is just share the link with your colleagues, friends or family to browse your pics. PhotoOnWeb offers easy and quick customization and creation of albums. Creating albums with PhotoOnWeb takes just couple of minutes, you need to add pictures and then simply click “Publish”. This web album creator resizes all the pics and host them over the Internet. You can use your ISP web space to post images and pictures or you can create a new account and host them over the space available by PhotoOnWeb . The online album creating software provides 20MB of free storage space on creating a new account on PhotoOnWeb. Note: In case you are required some extra space on PhotoOnWeb than you need to pay for it. Create Photo albums and hoist them on internet. Integrated with FTP(File Transfer Protocol) client. Imports all DVD project slideshows. Provides free space of 20MB on creation of new account on PhotoOnWeb. Allows to add comments on your albums. Host albums on your ISP web space(AOL, Comcast and many more). Supports multiple formats (GIF, JPG, RAW, TIFF, BMP, DNG, PNG). Also, check out our post on EraseTemp to delete temporary files in Windows 8. Get onto the homepage to install PhotoOnWeb to your Windows 8 PC. Execute the downloaded file on your Windows 8 PC. Launch PhotoOnWeb to your PC. If you already have an account on PhotoOnWeb or with your own ISP web space, then login with it and start publishing your memories. PhotoOnWeb is an remarkable tool to host all your memories on PhotoOnWeb. It also provides 20MB of free storage space on creation of new accounts.